Menstrual Calendar is based on real scientific researches. It helps you determine your fertile days of the month, so you can either achieve or avoid pregnancy. The calendar uses the date of your last period and shows the next period date, the best days to conceive a girl or a boy, your ovulation day and when you should avoid pregnancy. The application every woman must have! 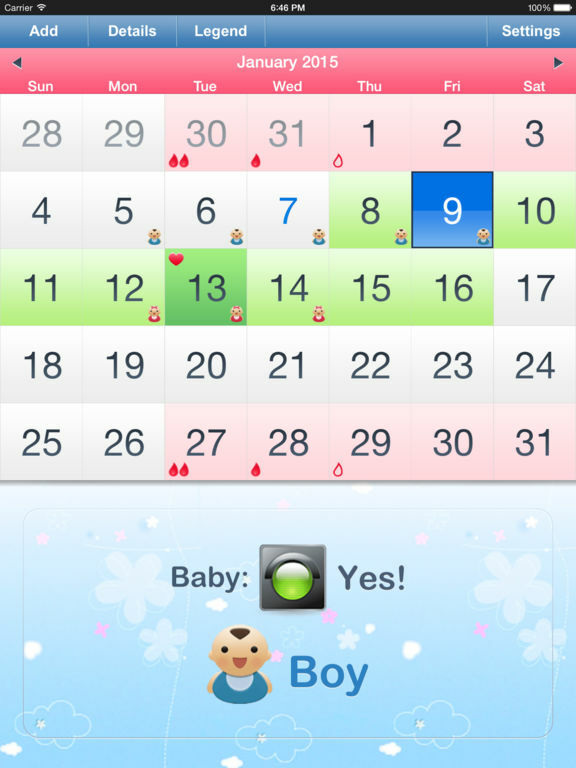 The application uses real scientific research of Rodrigo Guerrero, 1974 to predict gender of a baby. It’s based on real statistics of thousands and thousands women. As opposed to it the widely-spread Landrum Shettles method is based only on theory and totally incorrect. - The exact probability of getting pregnant on the current or selected day. - The exact probability to conceive a girl or a boy at the current or selected day. - Chance of getting pregnant during all the current period. - Chance to conceive a girl or a boy during all the current period.